Readability.com’s “sepia” style would be a really nice option. It’s black Cambria type on a sepia background. The typeface works well on all browsers on Windows, whether Directwrite font rendering is available or not. Cool, thanks for the feedback. 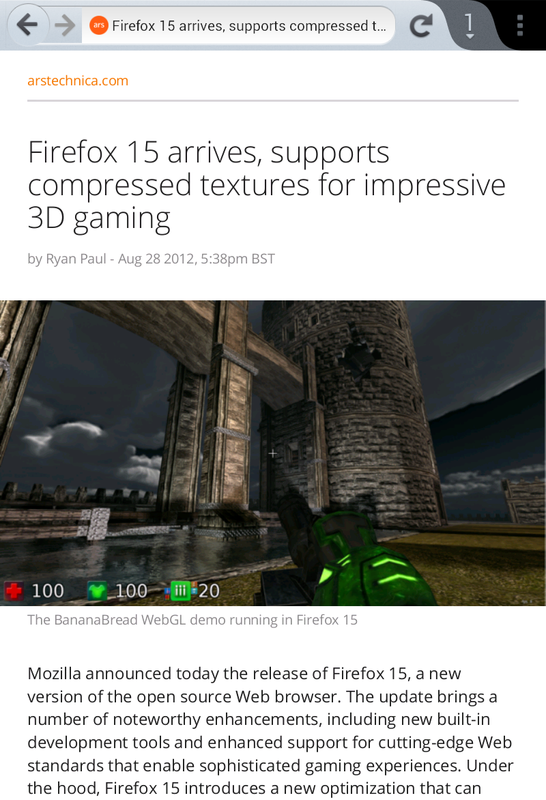 The current plan is to copy the styling options that Reader Mode on Firefox for Android offers. You can see screenshots of this at these two links: http://lucasr.org/wp-content/uploads/2012/09/reader-full.png and http://lucasr.org/2012/06/21/reader-mode-in-firefox-mobile/. Firefox for Android uses the OpenSans font, so it would be nice to use that here too since we would be able to use the same font on all platforms. Ha, I was also about to reply and add that a lot of people like Sepia so it should probably have heavy consideration. I can see from your comment links however show that that is already on the menu. I think it was you only mentioning the light & dark modes that made me “they must not be thinking of sepia yet”. Thanks, I updated the post so it is hopefully more clear for others. Should we open the “readable” page in another tab, or just in current tab (like Firefox for Android), or open an iframe right in the middle of the current page (like Safari)? Personally I would like to see it works like Safari, or just replace the current tab would be also acceptable. Open in another tab might not be a good process when reading, since I have to click to switch tab, read it, close the opened tab, close the current tab — a lot of steps. Thanks for the feedback. As mentioned in the post, the interaction workflow here isn’t final, so what you’re seeing now is something that the team has put together to help them work faster. I personally would prefer that the content open in the same tab and act similar to a page navigation, allowing the user to hit the Back button to get back to the original webpage. You are currently reading Status Update 7 of Reader Mode for desktop Firefox at JAWS.